This week I am on-call from work again so trips any distance from the house are completely out. As tonight proved though this isn't always a bad thing. A quick walk up the hill out back after work quickly led to a mystery as I could hear a strange bird call coming from nearby fields. I searched in vain for a while until all became clear as a Green Woodpecker flew overhead closely followed by another. 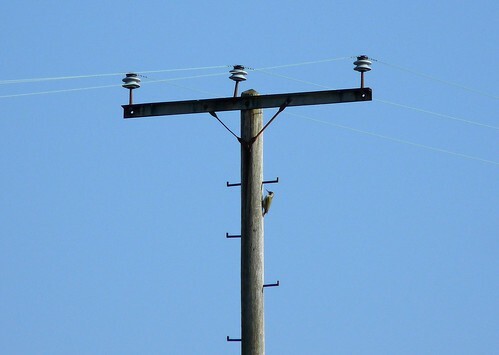 They stayed briefly in a nearby tree before moving on to the telegraph poles which seemed to be much more to their liking. They were however very flighty which meant that pictures were difficult but I did manage to get a couple of decent distant shots. Also out and about were several small flocks of Goldfinch and Greenfinch. Despite my best convincing techniques I just couldn't turn one of the male Greenfinches into a Crossbill. Well, I can dream can't I? Great stuff. 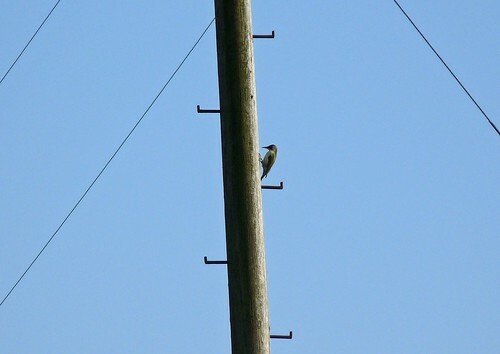 I've never seen them on telegraph poles, or any woodpeckers doing that! Nor me! 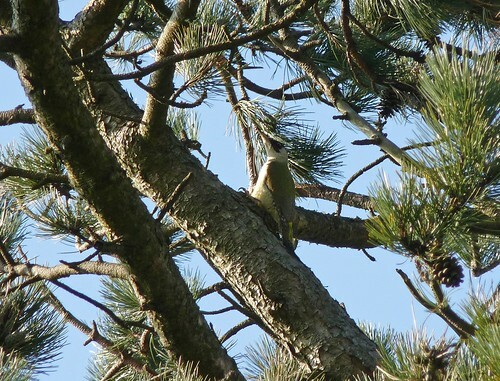 First time I have seen Green Woodpeckers up on anything actually as normally I see them feeding on the ground.